realistic preparation experience. The books have been fully updated to refresh the content for the latest CCNA exam topics and enhance certain key topics that are critical for exam success.Best-selling author and expert instructor Wendell Odom shares preparation hints and test-taking tips, helping you identify areas of weakness and improve both your conceptual knowledge and hands-on skills. This complete study package includesA test-preparation routine proven to help you pass the examsDo I Know This Already? quizzes, which enable you to decide how much time you need to spend on each sectionChapter-ending and part-ending exercises, which help you drill on key concepts you must know thoroughlyTroubleshooting sections, which help you master the complex scenarios you will face on the examThe powerful Pearson IT Certification Practice Test software, complete with hundreds of well-reviewed, exam-realistic questions, customization options, and detailed performance reportsA free copy of the CCNA ICND1 and ICND2 Network Simulator Lite software, complete with meaningful lab exercises that help you hone your hands-on skills with the command-line interface for routers and switchesMore than 150 minutes of personal video mentoring from the authorFinal preparation chapters, which guide you through tools and resources to help you craft your review and test-taking strategiesStudy plan suggestions and templates to help you organize and optimize your study timeThese official study guides help you master all the topics on the CCNA exams, including:Networking fundamentalsEthernet LANs and switchesIPv4 addressing and subnettingOperating Cisco routersConfiguring OSPFACLs and NATIPv6 fundamentals, implementation, and troubleshootingLAN switchingIPv4 routingVPNsOSPF and EIGRP configuration and troubleshootingWide area networks and Frame RelayNetwork managementWell regarded for its level of detail, study plans, assessment features, challenging review questions and exercises, video instruction, and hands-on labs, these official study guides help you master the concepts and techniques that ensure your exam success. 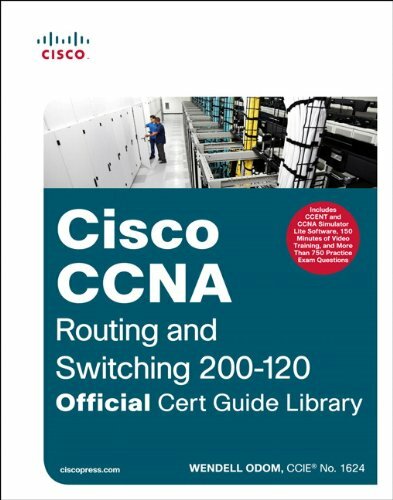 CCNA 200-120 Official Cert Guide Library is part of a recommended learning path from Cisco that includes simulation and hands-on training from authorized Cisco Learning Partners and self-study products from Cisco Press. Wendell Odom, CCIE No. 1624, is the most respected author of Cisco networking books in the world. His past titles include books on the entry-level Cisco certifications (CCENT and CCNA), the more advanced CCNP, and the industry-renowned CCIE. His books are known for their technical depth and accuracy. Wendell has worked as a network engineer, consultant, instructor, course developer, and book author, and he has produced videos, software, and blogs related to Cisco certifications. Companion DVDsThe DVDs contain two ICND1 practice exams, two ICND2 practice exams, four full CCNA practice exams, CCENT and CCNA Network Simulator Lite software, and 150 minutes of video training. Includes Exclusive Offer for 70% Off Premium Edition eBook and Practice Tests Includes 26 free CCNA Network Simulator labs:ICND11.Configuring IP Addresses I2. Configuring IP Addresses II3. Connected Routes4. Static Routes I5. Static Routes II6. Subnet Zero7. Loopback Interfaces8. Subnet ID Calculation9. IPv4 Address Rejection10. IPv4 Route Selection11. Subnetting and AddressingConfiguration Scenario12. Static Routing Configuration Scenario13. Network Discovery Troubleshooting Scenario ICND21.EIGRP Serial Configuration I2. EIGRP Serial Configuration II3. EIGRP Serial Configuration III4. EIGRP Frame Relay Configuration I5. EIGRP Frame Relay Configuration II6. EIGRP Route Tuning I7. EIGRP Route Tuning II8. EIGRP Neighbors II9. EIGRP Neighbors III10. EIGRP Configuration Scenario I11. EIGRP Configuration Scenario II12. EIGRP Metric Manipulation Configuration Scenario13. Path Troubleshooting Scenario Pearson IT Certification Practice Test minimum system requirements:Windows XP (SP3), Windows Vista (SP2), Windows 7, or Windows 8; Microsoft .NET Framework 4.0 Client; Pentium class 1GHz processor (or equivalent); 512 MB RAM; 650 MB disc space plus 50 MB for each downloaded practice exam CCENT and CCNA Network Simulator Lite minimum system requirements:Microsoft Windows XP (SP2/SP3), Windows Vista (32-bit/64-bit) with SP1, Windows 7 (32-bit/64-bit) or Windows 8 (32-bit/64-bit), Mac OS X 10.6, 10.7, or 10.8Intel® Pentium® III 1GHz or faster processor (Windows) or Intel Core™ Duo 1.83GHz or faster processor (Mac)512 MB RAM (1 GB recommended)1.5 GB hard disk space32-bit color depth at 1024 x 768 resolutionAdobe Acrobat Reader version 8.0 or higherOther applications installed during installation:Adobe AIR 3.6.0Captive JRE 6This volume is part of the Official Cert Guide series from Cisco Press. Books in this series provide officially developed exam preparation materials that offer assessment, review, and practice to help Cisco Career Certification candidates identify weaknesses, concentrate their study efforts, and enhance their confidence as exam day nears.